With the summertime right around the corner, I have been trying to stay on track with eating as nutrtious as possible. Working more fiber, and veggies into my diet has been a top priority and so far, this lifestyle changed has netted a 22 lb weight loss. With every pound I lose, I am more eager to clean up my diet and eat as wholesome as possible. 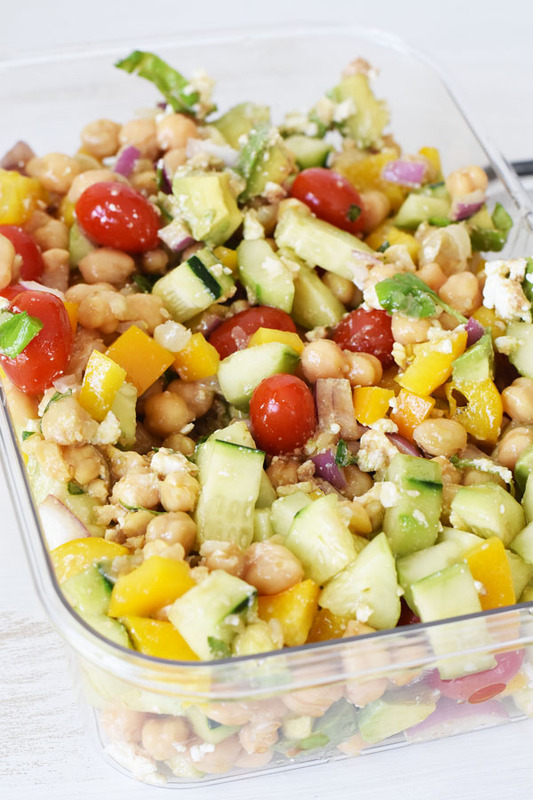 Meals like these Chick Pea Avocado Salad with Feta are easy to whip up and provide enough food for lunch all week. If I make two batches, both my husband and I can easily enjoy a flavorful and healthy lunch all week. Creating fresh recipes like this Chick Pea Avocado Salad with Feta is much easier when you have a good fridge system. I have spent way too many years letting produce go to waste because it was lost in my fridge. As strange as that sounds it is the truth and often led to moldy berries, or rotten peppers. Now, I use food storage systems like the Rubbermaid BRILLIANCE set. This easy to use food storage set is not only practical but easy on the eyes! 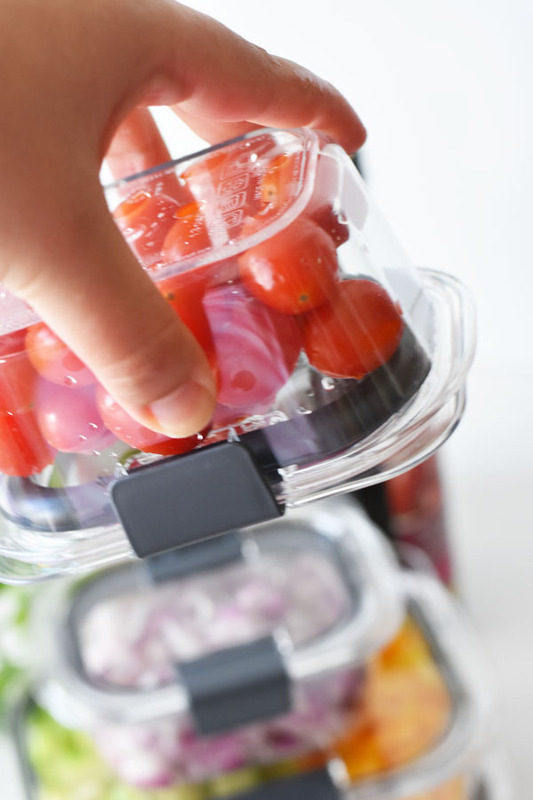 Now, I can easily prep my peppers, tomatoes, onions, and more on one day and store them in the Rubbermaid BRILLIANCE when I am ready to prepare the salad. Once I am done, each container can be washed again and used for the Chick Pea Avocado Salad with Feta storage. 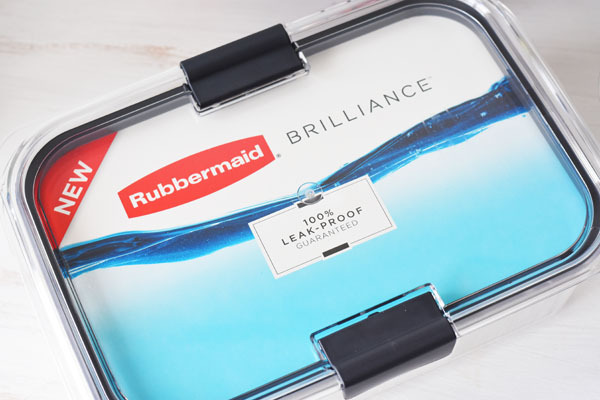 A few things I love about the Rubbermaid BRILLIANCE set is that each container is 100% leak proof, airtight, odor resistant, splatter resistant when microwaving, and they stack perfectly. Now, I can visually see all my fresh produce in these food storage containers to make food prep efficient and fun. Plus, having a neat fridge is always fun & greatly appreciated! The folks at SheSpeaks & Rubbermaid have generously allowed us to give away a 10-piece set of Rubbermaid BRILLIANCE set to one lucky winner! Enter using the widget below. US residents only! Ends June 8th at 11:59pm est! 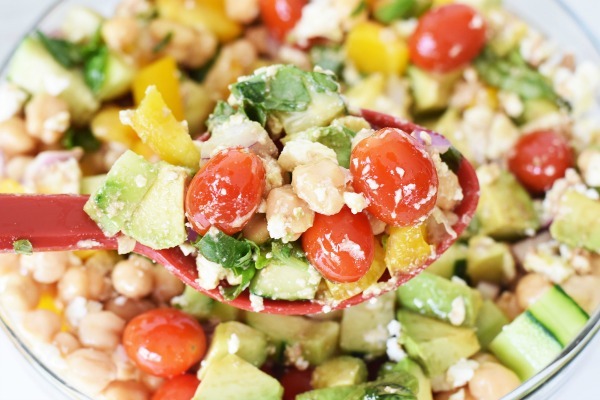 Want to make this Chick Pea Avocado Salad with Feta? Get the recipe below! A delicious and filling summer salad loaded with veggies, chick peas, feta cheese, and an oil & vinegar dressing. Reminds me of a tasty Greek Salad sans the olives. All all the chopped veggies & herbs to one large bowl. Drain the chickpeas and add them to the bowl. Add feat cheese in. Add oil & vinegar and stir Put salad in containers for the fridge. Allow flavors to meld for an hour. I’m thinking a great fruit salad or chicken pasta salad would be prefect to store in the Brilliance containers. 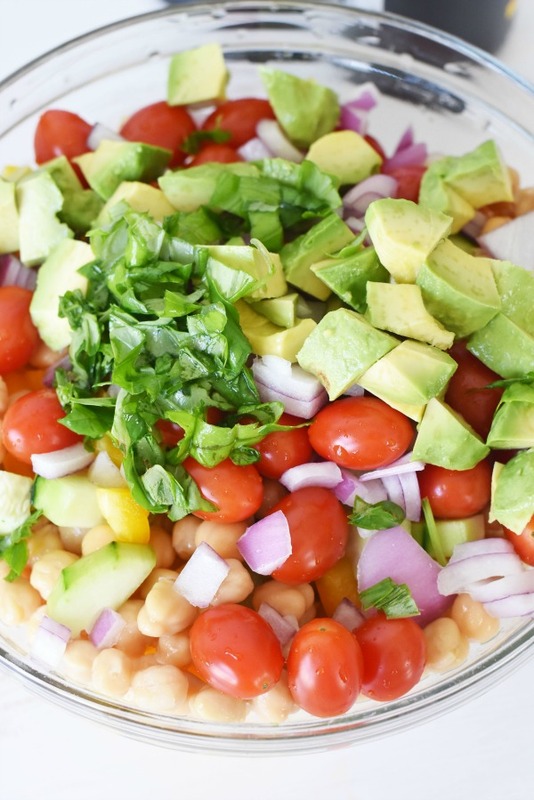 This chick pea with avocado salad sounds like a winner for the upcoming holiday weekend. I would love to prepare some sides for our meals. It would make my life so much easier to just put these in the refrigerator and then take them out when I get home from work. I would make quinoa salad, a family favorite. 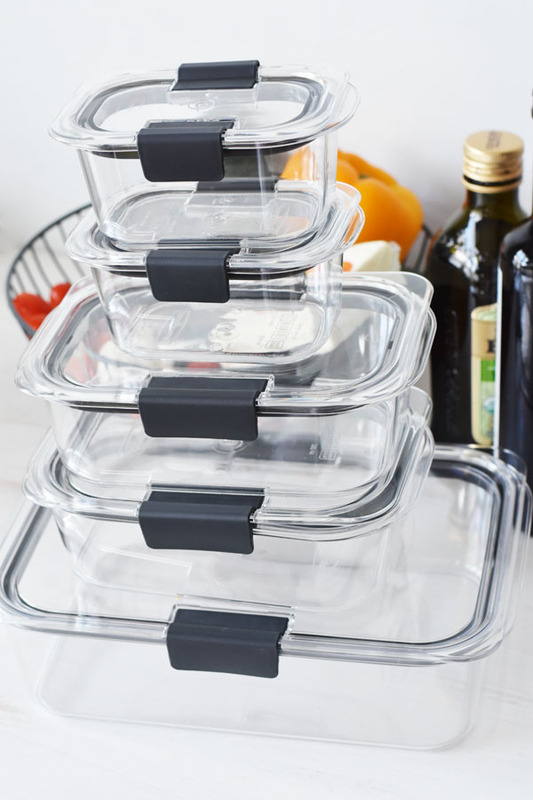 Those Rubbermaid containers look awesome! Our food storage containers definitely need an upgrade. We have drawers full of lids that likely don’t even have bottoms anymore. This recipe looks like one my boyfriend would love! Congratulations on your weight loss and all the success in the future. I really like the look of these containers and that they are leak proof. What a gorgeous salad. Ooh this salad looks yummy! And, I’m loving those containers. That sounds really delicious. I love the combination of the flavors and textures here. Thanks for a great recipe. That salad sounds awesome. This is so much better than some leaves and a few slices of tomato and cucumber. These containers look like a great way to store my lunch for work. 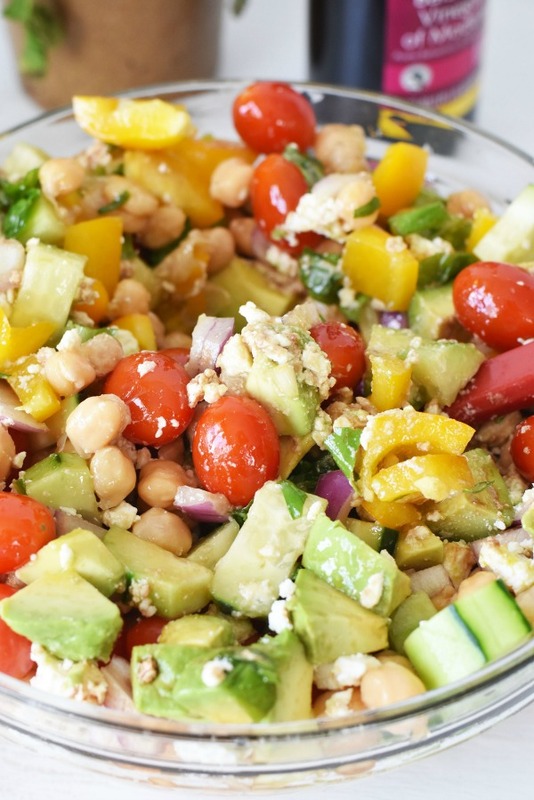 I will have to give this Chick Pea Avocado Salad with Feta a try this week. I would use these for taco fixings. 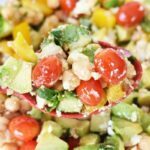 This Chick Pea Avocado Salad with Feta looks so delicious and easy to make. I wil have to get the ingredients I need to make some. I am sure it will be a big hit. I would use it to store toppings for when we have a baked potato bar. I would use these to store any of our leftovers from breakfast, lunch or dinner. They look so nice! These would be great for my husband to take his lunch to work in. Sometimes it’s leftovers and sometimes it’s a sandwich. Either way, these would be great. I love everything about this salad. Every. Single. Thing. Avocado being the biggest thing, and then everything else following that. Also, Rubbermaid has become the go to for lunch boxes for our family for homeschool field trips. Great looking salad. I love feta cheese. I will this because summer is here. Oh man this sounds really good. I love a good salad like this for summer BBQs. This is a must try recipe. I just love chickpeas and the addition of feta? yum! I love adding chickpeas in my salad! This is definitely a must make! I’d love to store homemade macaroni and cheese. I would chop the ingredients and store in these containers, a great tasting chicken stir fry. I would store homemade vegetable fried rice. I would use these when making stir-fry. 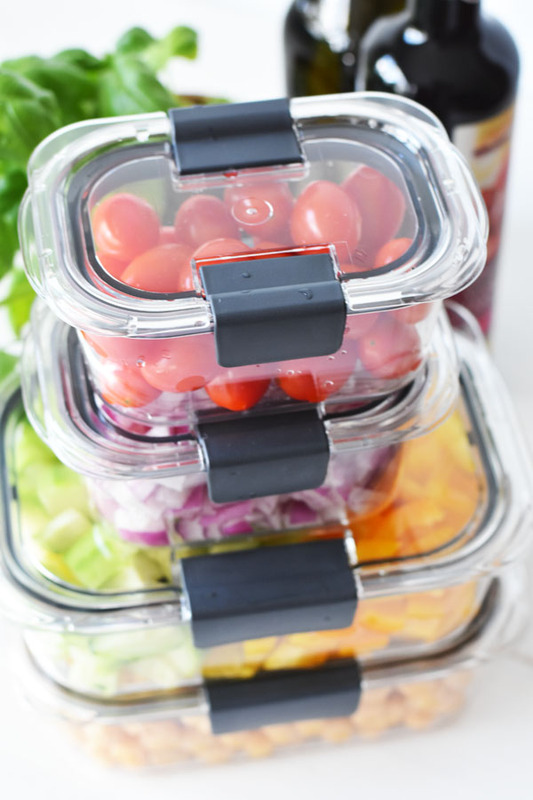 That’s a yummy-looking salad and I love the idea of these Rubbermaid food storage containers to store leftovers. A fresh corn salsa would be perfect! I would make a macaroni salad. Trying a new bacon avocado pasta salad today – i’d store that if there are leftovers. I would use these to make potato salad. I would keep my husband homemade meatballs and spaghetti sauce in these containers! This is a salad I would absolutely make and love! Yum! I’d store homemade macaroni and cheese – my family loves it and I always make a big batch so there are lots of leftovers for lunches the next day. I would make a tuna casserole!!! Well it’s June 1st so I’m starting to think about summer (and food)! I’d make a fruit salad with the containers. Putting everything together at a picnic so it’s fresh with strawberries, watermelon, blueberries, raspberries!!! Yum! I would use these for taco. I’d make fresh salsa – love that the tomatoes won’t stain the containers! I would make some guacamole! I would make a bacon ranch pasta salad. I would make a Chef salad. I’d love to store chicken noodle soup – no more spills/leaks with these containers! I would love to make beef stew for my hubby! My pineapple fried rice or some lasagna roll ups. I’d store chicken Parmesan – love that the sauce will not stain these containers! I’d love to make some homemade salsa and hummus to store in the Brilliance containers! I would make a taco salad. I would make macaroni and cheese. 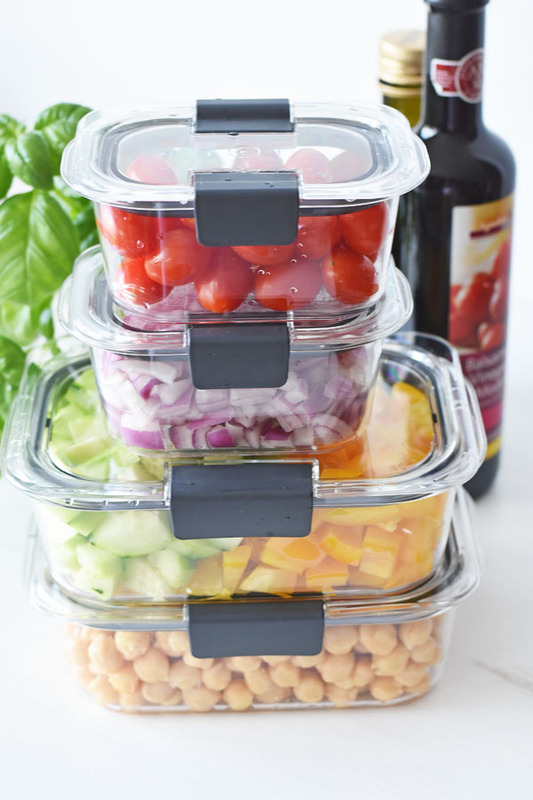 I would use the Rubbermaid Brilliance set for taco or pizza fixings. I would make a french onion dip for veggies!